Mural painting in Milan created for his patron Duke Ludovico Sforza and his duchess Beatrice d'Este. It represents the scene of The Last Supper as narrated in the Gospel of John 13:21, when Jesus announces that one of his Twelve Apostles would betray him. It covers the back wall of the dining hall (refectory) at the monastery of Santa Maria delle Grazie. The lunettes above the main painting, formed by the triple arched ceiling of the refectory, are painted with Sforza coats-of-arms. It was painted on a dry wall rather than on wet plaster, so it is not a true fresco. Because a fresco cannot be modified as the artist works, Leonardo instead chose to seal the stone wall with a layer of pitch, gesso and mastic, then paint onto the sealing layer with tempera. 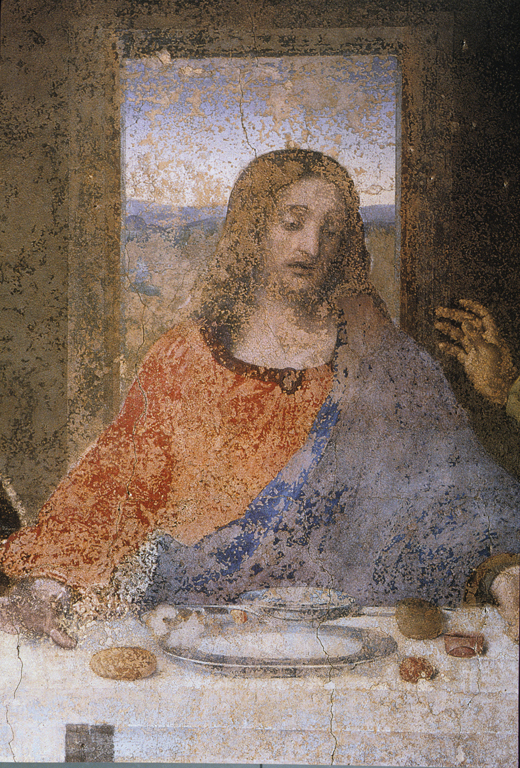 Because of the method used, the piece began to deteriorate a few years after Leonardo finished it. 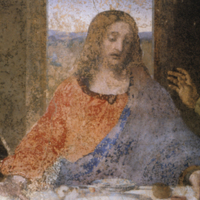 Leonardo da Vinci (Italian painter, 1452-1519), “Last Supper,” Institute Images Online, accessed April 24, 2019, http://westerncivart.com/items/show/2912.